In July 2012 the first Taizé song in the Finnish language was published. It is a concrete sign of the 50-year-long friendship between the Taizé brothers and the people of Finland. How did the friendship start? It started with meetings between people, first through writings. In the early 1960s Elisabeth de Godzinsky, who lived in Helsinki, Finland, read articles by Brother Roger in French Christian magazines. She was touched. The words about reconciliation were important for her, personally as well as socially. On a trip to France she had the opportunity to participate in the Sunday Eucharist in Taizé and to meet some of the brothers. The place felt like a spiritual home to her and she took it into her heart. For the brothers she was the first contact with Finland, this faraway country in the North. 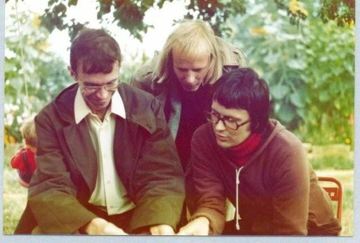 Another meeting in Taizé took place ten years later when a Finnish couple, Anna-Maija (née Raittila) and Taisto Nieminen, visited the community at the beginning of the 1970s. They also found their spiritual home there and through the brothers became friends with Elisabeth de Godzinsky in Helsinki. Brother Roger became their spiritual mentor and very close friend. Anna-Maija is a well known theologian, religion teacher, poet and translator, and her husband Taisto was also a translator. After a little while they joined others in preparing the “Council of Youth,” which had just been announced in Taizé. They translated texts into Finnish and talked about Taizé during their visits in different parts of Finland. Anna-Maija also translated Taizé songs into Finnish and taught people how to sing them. There were more and more meetings between people in the following years. Brothers and young volunteers from Taizé came to visit Finland. One of the volunteers was the present Prior of Taizé, Brother Alois. 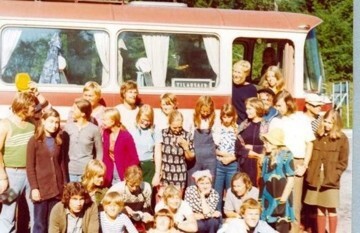 As a schoolboy in the 1970s, he made an unforgettable trip to Finland. Anna-Maija prepared the visits by organizing the travels and choosing the places to go in parishes, schools, groups and homes. This was practical ecumenism on the grassroots level, something new and exciting for many Finns. The listening attitude of the visitors and their humility were very touching. The songs of Taizé, the silence, sitting on the floor, the icons and candles created a new atmosphere for prayer. For many years Anna-Maija organized ecumenical evenings in homes and parishes. People were invited personally and information about these meetings spread by word of mouth. Meetings lasting a whole weekend also took place. The participants came from different churches and backgrounds. Together they shared their thoughts, prayed, took walks in nature and prepared meals. Anna-Maija gave guidelines for discussion based on the texts of Brother Roger and the Letter from Taizé. In these gatherings the personal touch was the new thing. People did not discuss theoretically but asked questions concerning their own life-journey and also listened to others. Anna-Maija began to write a circular letter called Tulisija (the hearth), where she gave news of Taizé as well of as other meetings. In this way, people in different parts of Finland had an opportunity to participate this common ecumenical adventure. For years, Anna-Maija also translated the Letter from Taizé, which is written by the Brothers and published regularly. Very soon Anna-Maija started to encourage young and not-so-young people to visit Taizé. Generally they travelled first by boat to Sweden and continued by train or bus. The trip generally took about 50 hours. Easter celebrations and summer meetings—sometimes in rain, sometimes in sun—are still engraved in many people’s memory. Visits were first made by individuals and later, beginning in the 1980s, organized group-trips from parishes were organized. Anna-Maija herself also led many such journeys and organized travels to the Taizé European meetings as well, sometimes together with young people from neighboring countries. Travels in another direction were also made—to the East. In the 1970s and 1980s Anna-Maija and Taisto travelled a lot in Eastern Europe, behind the Iron Curtain, on their own and also with brothers. The Soviet Union, Hungary, Poland, East Germany… In those days it was not easy to meet Christians living in those countries, but miraculously it became possible. Elisabeth created contacts especially in the Soviet Union, since she could speak Russian. During some summers she also stayed in Taizé a longer time to teach Russian to some of the Brothers. 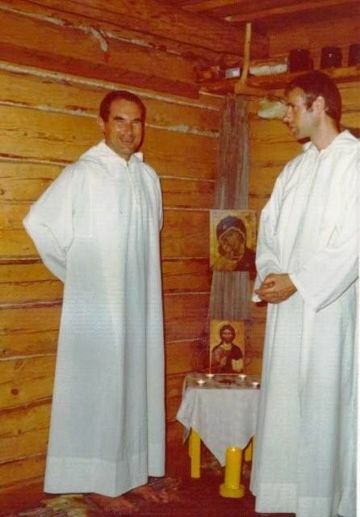 The Taizé Community became better known in Finland in the summer of 1979, when Brother Roger and Brother Alois came to Turku for the Ecumenical Church Days. The dream of a Finnish Christian community was born there. It was started with the name Omenapuukylä (Apple Tree Village) near Salo. Later it moved to Kaarina and got the name Morbacka. From there it moved again to its present location in Kangasala and is called Ukinranta. The life is based on regular prayer in “joy, simplicity and mercy” and the house is a part of an ecumenical association called Sinapinsiemen (mustard-seed). Ecumenical Church Days were also held in Turku in 2007 and again Brother Alois was present, this time as the Prior of Taizé. By now, Taizé was very well known amongst Finnish Christians and during those days many people visited the “Village of Silence” and the prayers held there. Taizé songs were sung during the prayers and these songs spread throughout the country. They are used a lot in parishes. More and more young people, both individuals and groups, have been finding their way from Finland to Taizé. After returning home they are often inspired to start prayers or other meetings in their home town. In Helsinki, for example, a weekly prayer has been held for many years. Everybody is welcome. It started in the 1980s in an Evangelical Lutheran parish church, moved after some years to a Roman Catholic chapel, from there to a Russian Orthodox church, and it is now held in the crypt of the cathedral. In the summertime the prayers are held in the chapel on a small island near the city. Elisabeth and Taisto have passed away and are with God. Anna-Maija, our spiritual mother, has retired and lives in a home for the aged in Helsinki and welcomes friends from near and far. The situation has changed but the friendship with Taizé, inspired by these three dear persons, continues. New people continue with the different tasks: translating the Letter from Taizé, translating the songs, welcoming guests and organizing travel. New young people and adults are inspired by the invitation of Taizé to search for reconciliation and hope with others. And many “former young people” carry with them provisions for life found through Taizé: friends, a wider faith, a desire to work for the unity of the Christians and to help the poorest as well as trusting amidst the difficulties of life. We Finns are very happy about the Taizé-Helsinki 2012 meeting and hope that many young people from our own country, from neighboring countries and also from far away will come to Helsinki from the 28th to the 30th of September 2012. We are looking forward to meeting you!